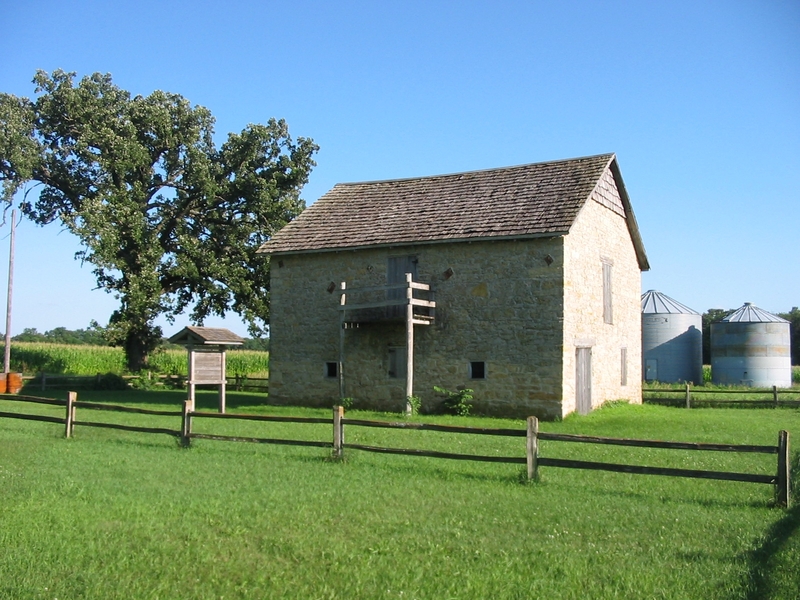 In 1854, Nels Severson, a member of the Clausen Colony of St. Ansgar, together with the Lee family, came into the area of what is now Carpenter, Iowa. Mr. Severson preempted a tract of land extending east from the Mitchell-Worth County line along the north bank of Deer Creek. Log cabins were erected along the banks of Deer Creek. Then came the Civil War -- and the men joined the Union Army. Upon their return home in 1865 many new settlers had come to settle along Deer Creek, a heavily wooded area. Later, in 1867, this stone building was erected due to the anxieties caused by the Spirit Lake, Iowa, and New Ulm, Minnesota, indian massacres. The Deer Creek settlement felt the need of a fort for shelter and protection. Indians seen scouting along Deer Creek did not put the settlement at ease, and thus Fort Severson became a reality, bearing the date of 1867. It is of typical fort-like construction. The walls, built of native limestone taken from the banks of Deer Creek, are about two feet in thickness. They appear to be as plumb and substantial as when built. The building measures 32 by 36 feet and is of sufficient height to provide for a second story. The inside structure consists of heavy hand hewn oak timbers mortised into the stone walls; these provided the support for a second floor. On the north side of the building is an opening apparently used for entry to the second floor, as evidence of a platform and stairway remain. 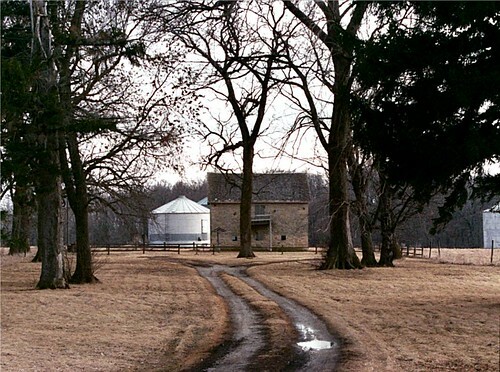 The builders, of whom Nels Severson was in charge, knew how to make the most of materials at hand and having been in the Civil War, they understood proper fort design and were familiar with the use of firearms, rifles and Gatling guns, a type of machine gun capable of firing 600 rounds a minute. Ranging along three sides of the building are a series of eight framed holes in the wall; too small for windows or doors, but large enough to be used as portholes through which guns could be fired. The upper port holes were placed there to accommodate the rifle men. The larger openings below would have been just right for the Gatling gun. There is no evidence that these guns were ever used. Reports from old settlers in the area who were descendants of pioneers, establish that it was built for a fort, but never used as such. 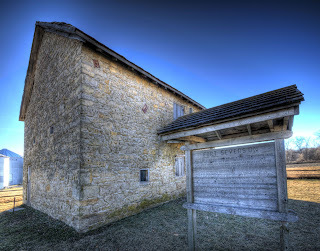 A stone near the apex in the west gable end of the building bears the date of 1867 which was just a few years after the New Ulm, Minnesota, Indian scare and massacre. The building was used later, however, as a stage coach stable and inn. According to Patrick Seuser of Northwood, the stage line from Northwood to St. Ansgar passed this point. 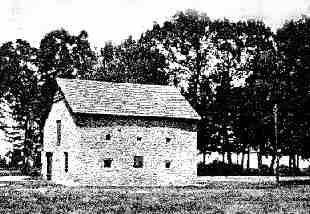 It proceeded from the area of the Deer Creek Lutheran Church, along the north bank of Deer Creek, across the David Goplerud farm, the Vervaecke farm and the Ossian Hollatz Adrian farm. 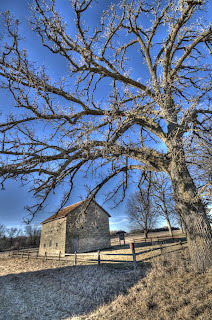 On this route it passed the stone school house, through the dooryard of the Ossian Hollatz farm and near a lone tree which is visible from the highway. From this point it extended east to the Cedar River where it joined the north and south stage line at a fording place. At this time many immigrants were passing through from the eastern states to point's farther west. This old fort, then an inn, became a popular stopover place for these transient settlers. While staying at the inn they had an opportunity to look over this part of Mitchell County with possible settlement in mind. 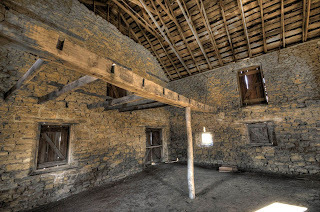 The interior of the old fort indicates that a part of the first floor housed horses and the remaining part was used as an inn. Sleeping quarters were provided on the second floor, which also provided easy access to the portholes. At times as many as twenty people slept on the upper floor, which was reached by a stairway. There is evidence also, on one wall, that a fireplace had been a part of their needs. It took the appearance of an old military blockhouse. There were also facilities for the travelers to prepare meals. An explanation is necessary as to the passing through of numerous travelers. Fort Severson was on the route of the Kansas City, Rochester, Minnesota stagecoach line and thus it conveniently became, secondly a stage coach depot. Lela Stewart McGill and Myrtle Lee Anderson, both of Osage, Iowa, have stories, told by their grandparents, of Indian uprisings. Fortunately there were no repeat in the Deer Creek area of the Indian massacres experienced at Spirit Lake, Iowa and New Ulm, Minnesota. Could the presence of Fort Severson have discouraged them? Often, the Indians came and asked for food, which our families gladly shared, especially baked bread, chickens, and dairy products. In the early 1870's the Chicago, Milwaukee and St. Paul Railroad track was built through Carpenter. 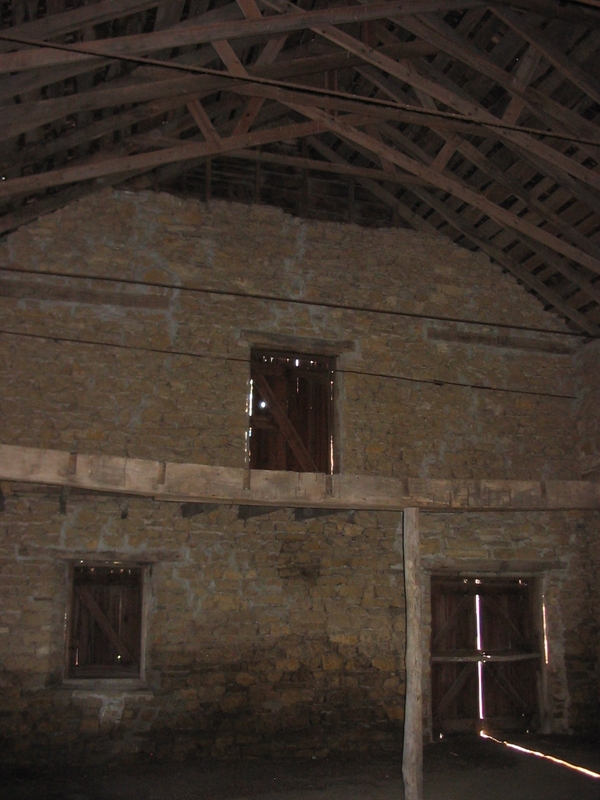 This introduced a new way of life and transportation, and Fort Severson was more or less abandoned, and became known as the "Severson Barn". As a "hired girl" for those who had rented this place, 1915-1917, states "I gathered many a basket of eggs from this treasured pioneer building that had been converted inside, to be a chicken house". Mitchell County Historical Society, wanted some project for the upcoming celebration of the Bicentennial in 1976. He, along with Louis Vander Myde of St. Ansgar, Iowa, concentrated on the restoration of Fort Severson for their project. The Gordon Brothers, Lynn and Roy, contractors and grandsons of the Gordon settlers, did the construction work. Walls were repainted, cracks repaired, walls braced and tied together, new window and door frames and a new roof covering of cedar shakes. Care was taken for authenticity and changes were kept to a minimum. Fort Severson today, August, 2002 is 135 years old and in remarkably good condition. The rail fence surrounding the fort was donated by a granddaughter, Mrs. Viola Severson Burtis. She also provided the plaque hanging within the fort, which tells its story. The fenced-in space, on which Fort Severson stands, was donated by David Goplerud. The road leading to the building was put up by the Mitchell County Highway Department. The Cedar Valley Electric Co-op cut down trees that were obstructing the roadway, and L.R. Falk Construction Company grubbed out the stumps and furnished the crushed rock for the new road. The first register book kept in the fort showed signatures of over 1,000 people, coming from all directions of our United States. "From the mountains to the prairies, to the oceans white with foam" they come. When vandals burnt the register and burned the plaque, Dora Biedermann, daughter-in-law of William Biedermann, gratefully replaced the plaque. This building was erected ten years before the founding of the Deer Creek Lutheran Church and before the town of Carpenter was started. 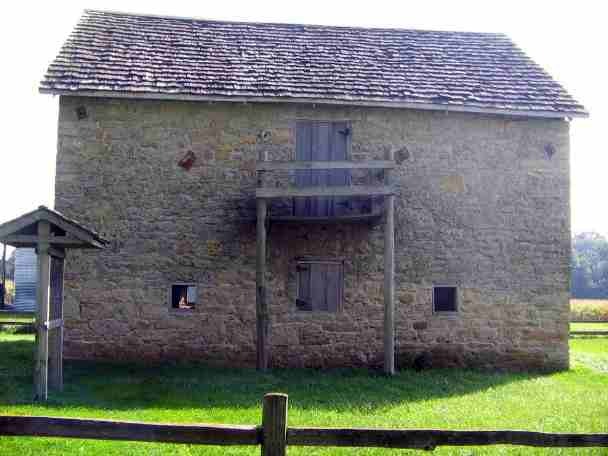 When the railroad supplanted the stage coach lines as means of transportation, this old fort and inn was used as a farm building. Through the persistent efforts of William Biedermann, Fort Severson was placed on the Nation Register of Historic Places in July, 1976. Approximately 300 people from all parts of the county and neighboring towns were in attendance at the dedication. LOCATION: Approximately 1/2 mile east of Zinnia Ave on 456th Street. From Carpenter travel north on Zinnia one mile, turn right (east) on 456th Street. Proceed on 456th until you see the old Indian Fort on your right. 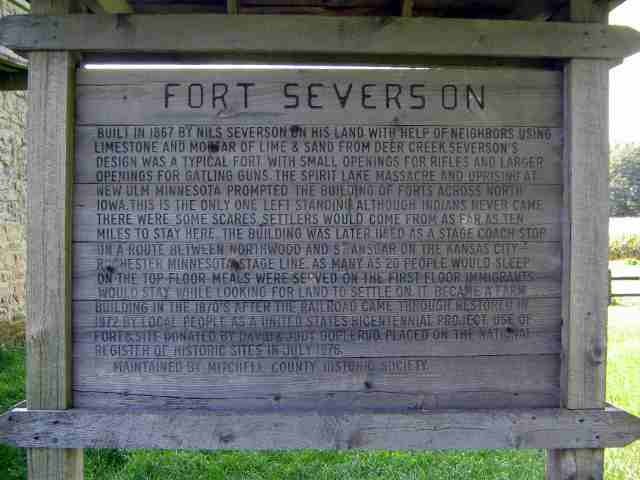 Fort Severson is owned by the Mitchell County Historical Society, and is located at 1068 456th Street, north of Carpenter, Iowa.